Mary Jane Bryson, known as Jane, was born on February 7, 1933 in Columbia, Missouri, the daughter of William Ritchie and Nada Mary (Finlay) Bryson. She grew up and attended school in Sullivan and Eureka, graduating from Eureka High School, class of 1951. Jane was united in marriage to Eugene Diekmann on December 10, 1960. They adopted two children, Todd and Janene, and lived in Eureka until Eugene’s sudden death in 1976. Jane continued to live in Eureka, working for Ill-Mo Bobcat for a number of years and raising her young children. On April 11, 1984, she was united in marriage to John D. Scott of Sullivan, and her family grew with the addition of three stepchildren: Georgia, Wendell, and Bradford. Jane joined John in operating the Western Auto Store and Western Furniture for many years. They retired from the business in 1996. Jane was a loving wife and proud of her children and grandchildren. She and John were active members of St. Matthews Lutheran Church. Together, they enjoyed going to dances in the area and playing cards with friends. Jane liked fashion, flowers (especially the wild flowers John picked for her), maintained many lifelong friendships, made friends easily, and celebrated life every day. She will be lovingly remembered and missed by her family and many friends. Mary is survived by husband of nearly thirty-five years, John Scott of Sullivan, MO; five children: Todd Diekmann and wife, Kathryn, of Desoto, MO, Janene Diekmann and fiancé, Franklin Swain, of Jacksonville, FL, Georgia Scott of New Orleans, LA, Wendell Scott and wife, Jamie, of Springfield, MO, and Bradford Scott and wife, Susan, of Des Peres, MO; six grandchildren: Nicole Diekmann, Cecilia Scott, Elliott Scott, Rachel Scott, Drake Scott, and Alexandra Scott; one great grandson, Todd Phillip Buerk; and other relatives and many friends. She was preceded in death by her first husband, Eugene Diekmann; and her parents, William Ritchie and Nada Mary (Finlay) Bryson. Funeral Services will be conducted 10:00 AM, Monday, April 1, 2019 at the Eaton Funeral Home in Sullivan, with Pastor Lew Ensor officiating. Burial will follow in Midlawn Memorial Gardens in Union, MO. Visitation will be held from 2:00 PM to 6:00 PM, Sunday, March 31, 2019 at the Eaton Funeral Home in Sullivan. Memorial contributions may be made to St. Matthew Lutheran Church of Sullivan, MO. 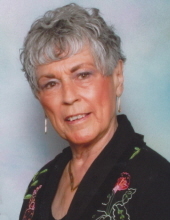 Friends may send online condolences to Mrs. Scott’s family at www.eatonfuneralhome.com. To send flowers or a remembrance gift to the family of Mary Jane Scott, please visit our Tribute Store. "Email Address" would like to share the life celebration of Mary Jane Scott. Click on the "link" to go to share a favorite memory or leave a condolence message for the family.